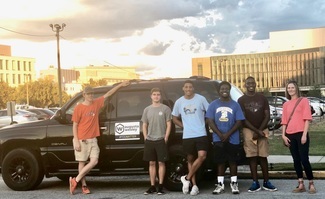 Drivers are needed on Mondays to pick up Students at the bus stop in front of Oak Hall, 830 Spellman St, at 6:45pm, drop them off at the Foundry, 801 Greene St, and return them to Oak Hall at 8pm. Some special pick up times are noted on certain dates. Please be willing to go back for a 2nd pickup. There is a magnetic car sign with the Wesley logo that can be picked up in the church office and put on your car door when you drive. This lets students know you are their driver.